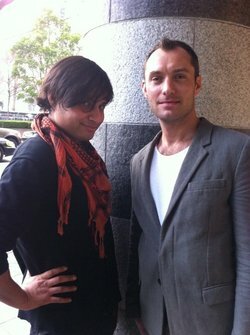 More fantastic ~Jude Law~ sighting around town. And boy, someone is having fun on the town (someone is quick on your heels, Willie Brown). Mister Law was spotted dining at both Boulevard and Farallon (where he reportedly loved the food and wine pairings), and according to a tweet from the one and only Leslie Sbrocco, he also had a drink at Rickhouse bar. There were some tweets last week with sightings of actor ~Jude Law~ filming scenes from the upcoming film Contagion in SoMa (here’s a pic of him at SFMOMA, and some creepy on-set pictures here). Jude also dined in a private dining room at Spruce with director Steven Soderbergh.